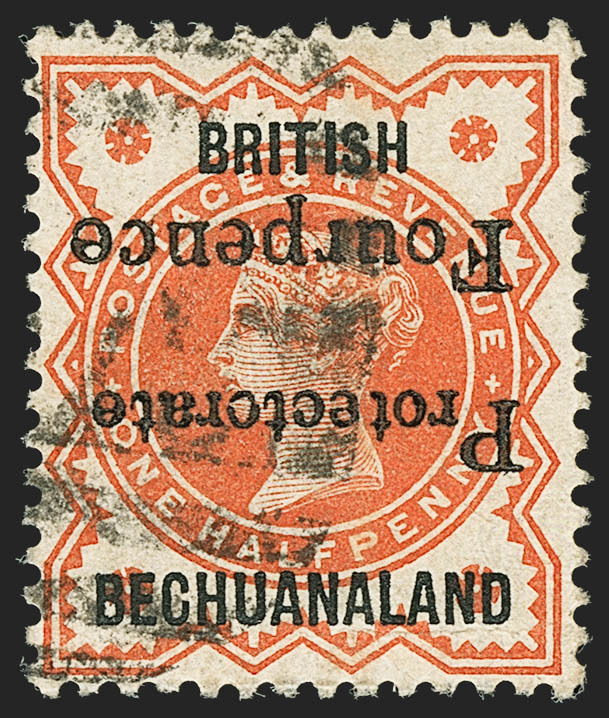 I’ve had a request from a fellow enthusiast into the existence of overprint varieties on the Bechuanaland 1/2d vermilion used on cover. 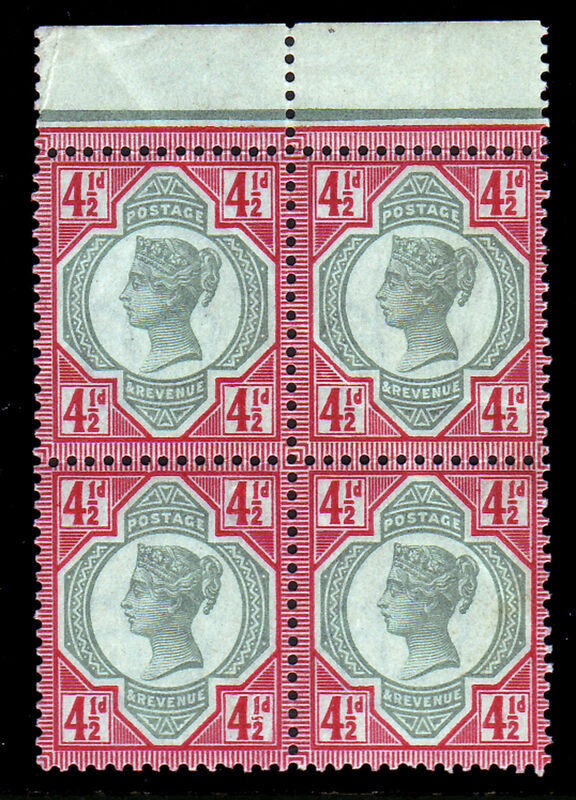 Specifically inverted or double overprints on SG numbers 53, 54, and 55. I have not seen any before, but I have heard that in his long search the enthusiast has managed to find a 1913 Tamsen cover with a SG54a block of four. 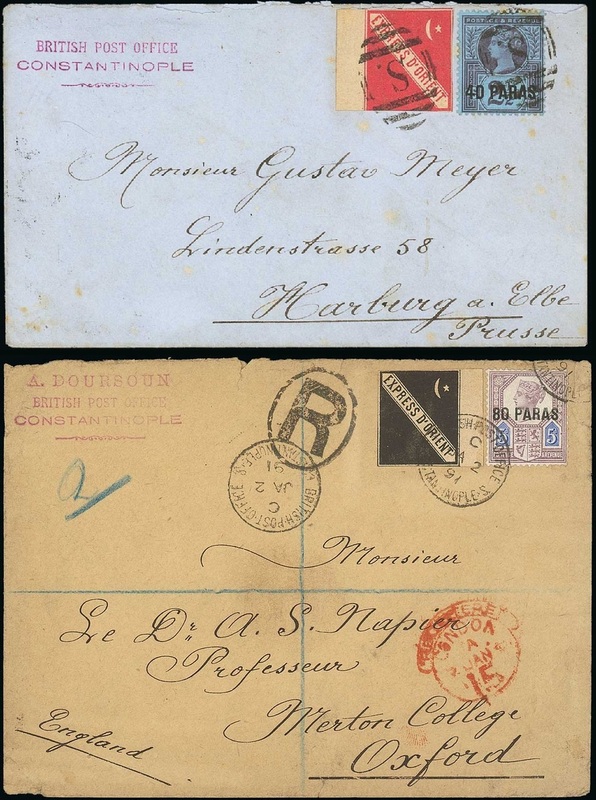 Presumably other philatelic covers from Tamsen must exist? There may have been nothing on Ebay since the start of the year but there was plenty of material to interest a Jubilee collector which came up in the British auction houses. Lot 1541 in Spink’s latest offering from the never ending “Lionheart” collection (part 7!) included a Bechuanaland Protectorate 4d on 1/2d with inverted surcharge, which inspired me to publish my census of all the examples I have come across. 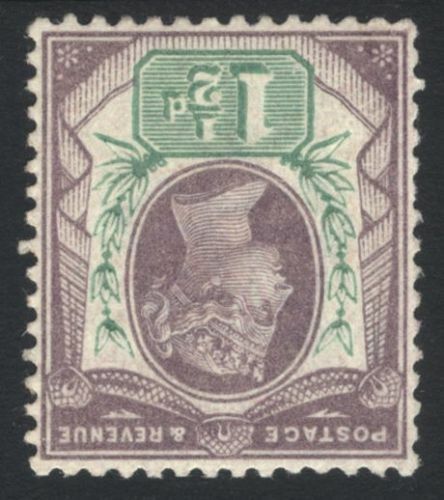 This example has a small wrinkle at the lower right, and sold for £1’100 plus 25% in fees. Also from Spink but from their January Philatelic Collectors Series was lots 1032 and 1033, two British Levant covers with “Express D’Orient” labels. As far as I’m aware, these labels didn’t pay for any postal service and are basically vignettes/cinderella stamps which were likely created by the enterprising Postmaster of the Constantinople office for collectors. Note that both of these envelopes come with his Post Office cachet and I believe are in his handwriting. The black label is rarer and this cover fetched £950 plus commission. The envelope with the red label was in better condition (and looked better in the flesh than it does in the scan) and sold for £850 plus commission. Among a nice selection of Niger Coast (of which many items were ex Sacher) in Grosvenor’s March 1st sale was this attractive item. With two 2d and two 1/2d tied by orange-red Benin circular rubber cancels, I couldn’t resist bidding on it. Estimated at £500-600 I guess I was the only bidder as I got it for £500. Unfortunately it was liable to 5% import duty, so commission on the hammer price was 29% (gulp!). They also wanted to charge me £18 for submitting the bid through their website but I’m not going to be paying that! I’m sure I say this every year, but my New Year’s resolution to do more work on the website has started poorly with the blog a month behind already. Actually there has been very few items of interest on Ebay, but the first item I will talk about was quite a special item to find as I didn’t remember ever seeing one before. 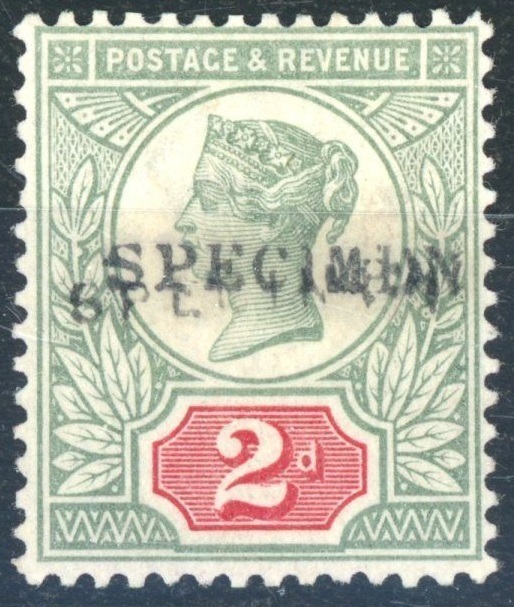 This 2d green & carmine was simply described as a 2d with specimen overprint. Even at a quick glance it’s noticeable that it has been overprinted twice, and with a closer look you’ll notice that it has two different type of the specimen overprint, types 9 and 12. Listed in the SG Queen Victoria specilaised as K30sa with a catalogue value of £225 for mounted mint, I took a look at Gibbons sale catalogue of the “Aureum” Jubilee collection from 2016 to see if they had one. They did, and with the comment “the first example we have handled for over 15 years”, it had a price of £550 and evidently sold. If I could have I would a bid at the very last moment but as I was travelling I couldn’t. As a result I pushed the price from £41 to £310 but give the other bidder time to increase his bid and I lost it for £385. Another item which realised almost the same price, but is significantly less rare as far as I’m aware was this unmounted mint 4d green and brown with inverted watermark, which sold for £388 plus postage (against a SG catalogue price of £1’500). 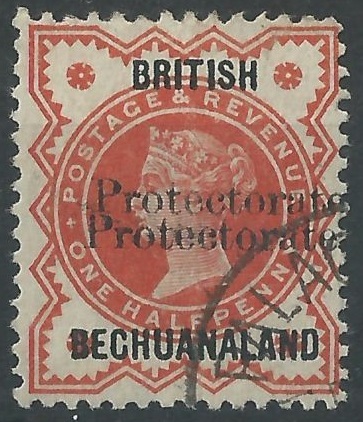 And I finish with the Bechuanaland Protectorate 4d on 1/2d inverted surcharge. Catalogued at £4’000, it sold for £87.72… The suspiciously poor quality image is always a red flag and it had no expertising certificate. Looking at the shape of the letters in “Fourpence”, I’m pretty sure it’s a fake. Either that or someone got an absolute bargain! We start this ebay report with what is I think the most valuable Jubilee item I’ve seen sell at auction on ebay. I would have been gutted to have missed it but I would never have thought of paying as much as $2’850 for the cover below. Sent to the Portuguese colony of Macao with a 5d Jubilee, it was then re-directed to Japan with a Macao 40r. 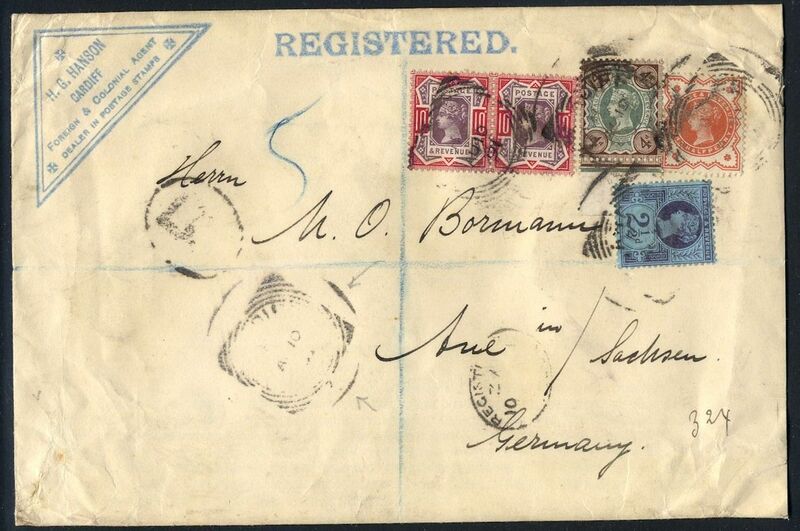 It’s an extraordinary mixed country franking and Macao collectors have the hunger and the cash for such unusual items. 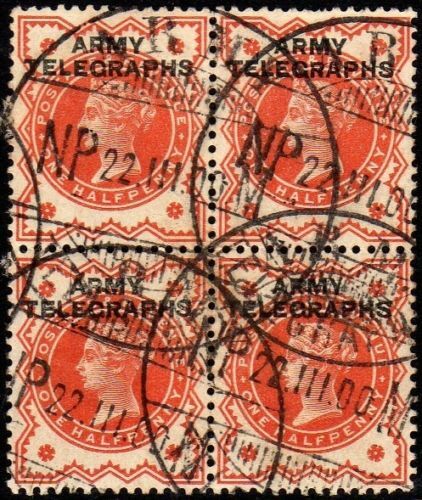 This is a rare used block of four of the Army Telegraphs overprint on the ½d vermilion. I’ve seen very few used examples (less than a dozen of the vermilion and I don’t think any of the ½d blue-green). So I might regret not trying to beat the final realisation of £129.25. This unmounted mint example of the 1 ½d with inverted watermark variety sold for £460, which is just a little under half the Stanley Gibbons catalogue price of £950. This slightly ugly cover is an unusual usage of the 4 ½d. 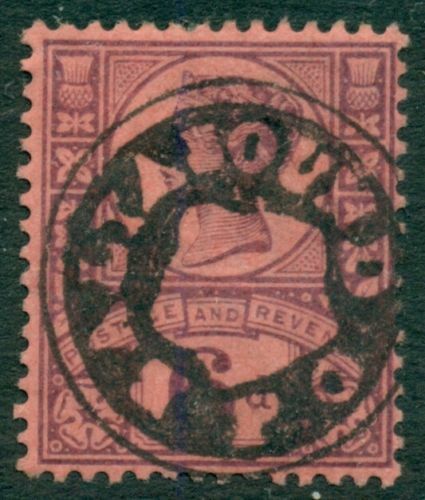 It is paying the 2d registration rate and 2 ½d to send the cover from York to Plymouth. It is only the third single franking of the 4 ½d I’ve seen on an internal letter. 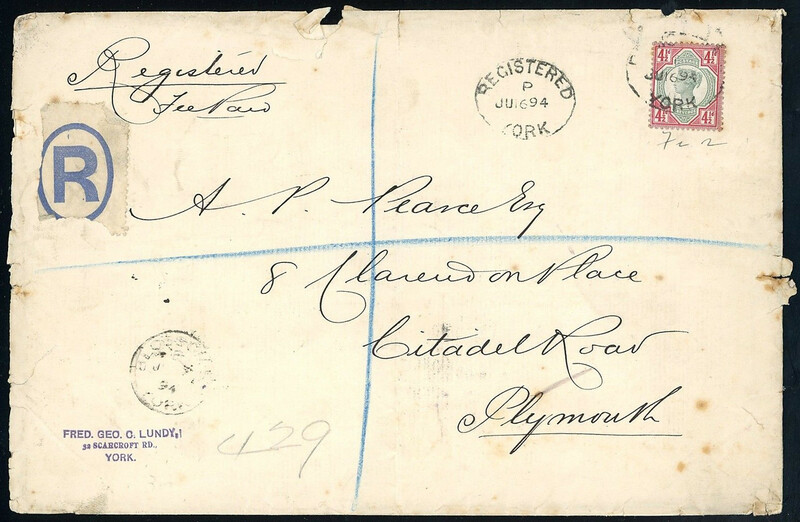 And finally quite an attractive uprated postal stationery cover to Belgium from Jersey. These types of covers from Jersey always sell well; this one realising £135.10. Next up is an impressive printing error on the ½d vermilion, caused by the corner of the sheet being folded over before printing resulting in a portion of the stamp being printed on the gummed side. They are not massively uncommon, and I always feel dealers ask too much for such items. So it was surprising to me that this sold for £446. This attractive franking also surprised me by fetching £100. 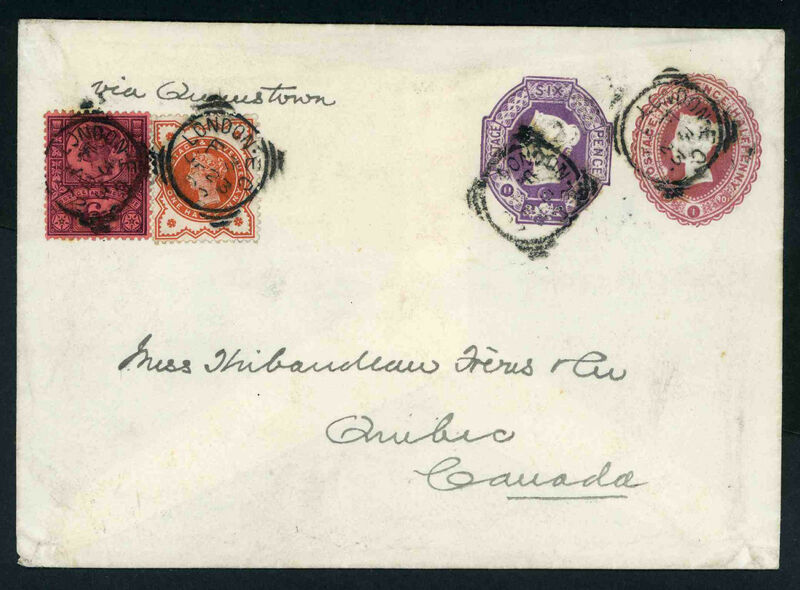 These high franking combinations of stamped-to-order postal stationery uprated with Jubilees always seem to sell well. My best ebay purchase of the Autumn season is a 2d that shows the variety “bottom right corner of tablet raised” (SG K30f), which catalogues £90 unmounted in my old 14th edition SG Specialised catalogue, and for which I paid the princely sum of £4.32. There are unnoticed catalogued varieties on stamps to be found on ebay, but it is a laborious task! And we finish with this unusual combination of a late usage of a line engraved 1d red and a ½d vermilion which sold for £16.95. 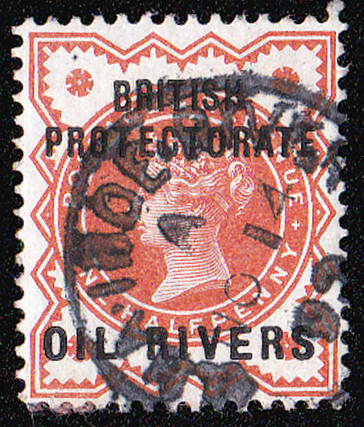 First up is a scarce Qua-Iboe River cancel from Niger Coast on an overprinted 1/2d vermilion which sold for £30.35. 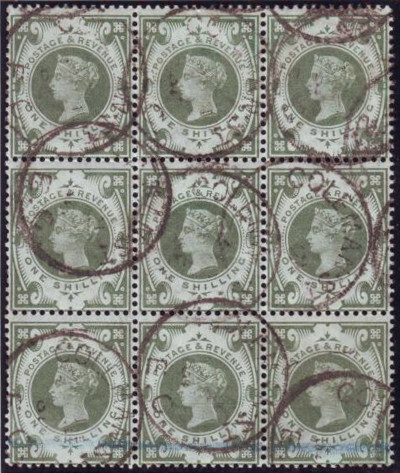 Next up are two blocks featuring constant varieties listed in the Stanley Gibbons Specialised Volume 1, although neither were highlighted by the vendor. 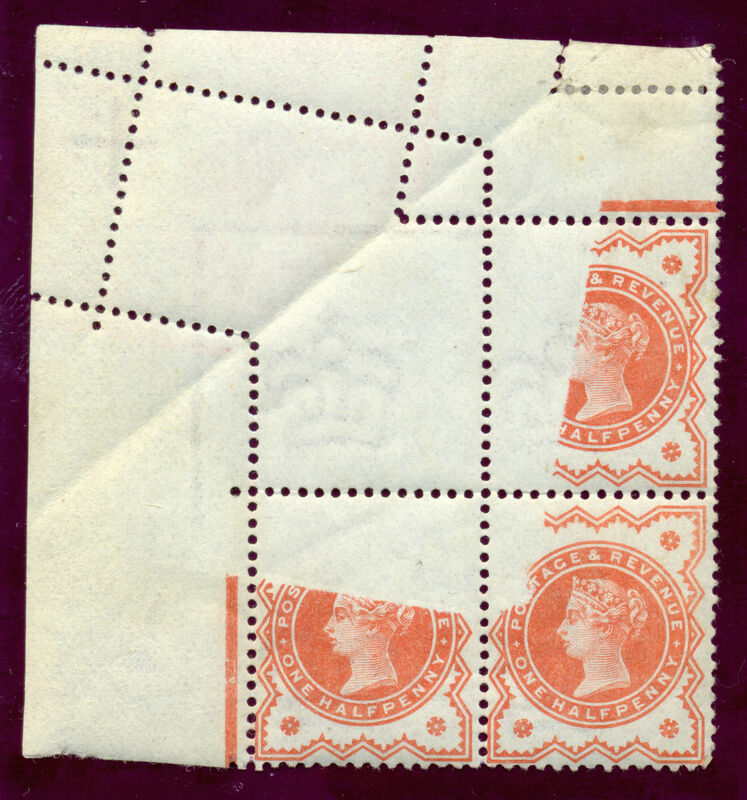 The 4 1/2d block shows the variety “broken bar to fraction” (SG K34h) which affects the fraction bar on the right “1/2” on the lower left stamp in this block. Catalogued at £90, it sold for a respectable £52.10 so a couple of people must have spotted it. However the variety featured on this block of 1 1/2d was a much better buy. 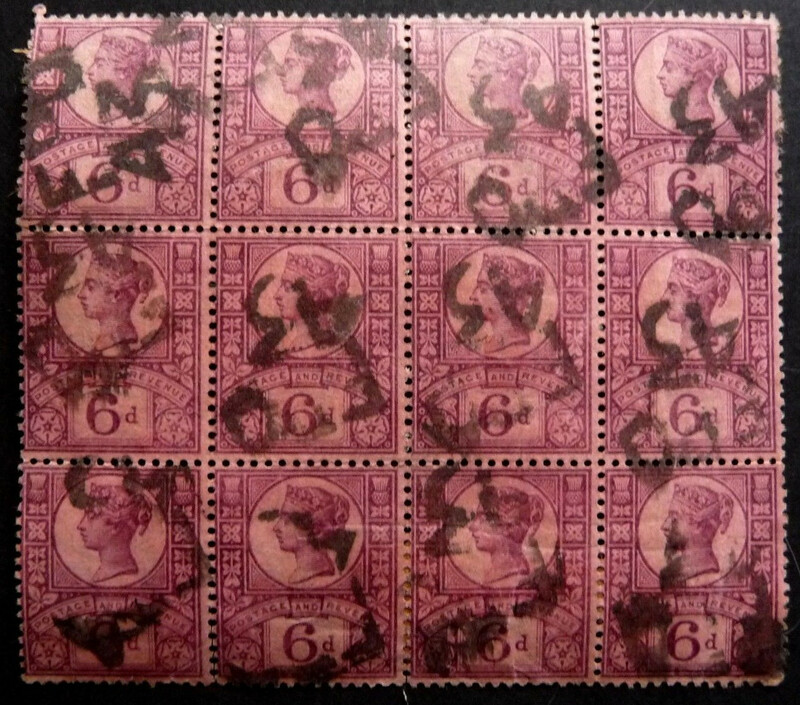 The lower right stamp in the block shows the variety “retouch left of tablet and around large figure 1” (SG K29f) which catalogues at £600 for a mounted mint example. So I was rather happy to pick it up for £67.09. 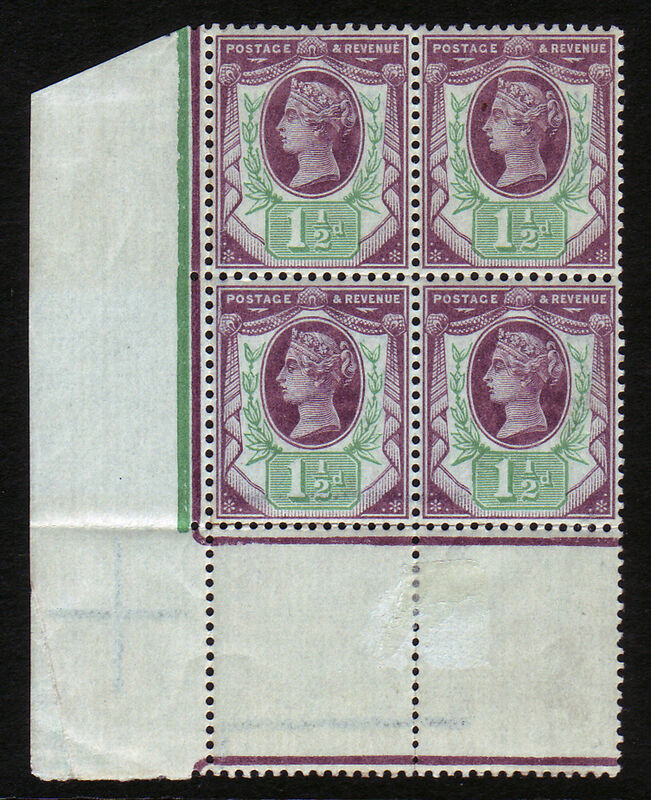 Stanley Gibbons are currently offering a mint nh interpanneu block of 8 with this variety for £1’200! In fact if I hadn’t had been studying the catalogue the day bidding finished I probably would have missed it. 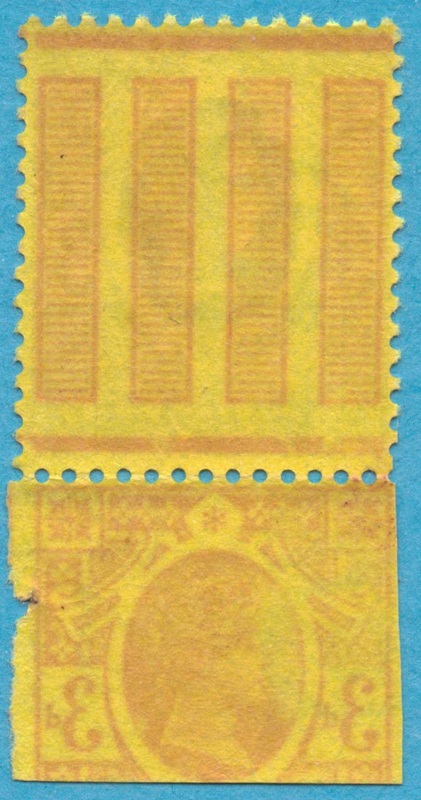 This block of 12 6d Jubilees is a scarce used multiple, but what it more interesting is the cancellation. Without my references in front of me, I think that the “FPO / 43” cancellation was used during the Boer War. So even with the faults (some splitting and creasing), I think the right person would pay more than the £29.70 it realised. 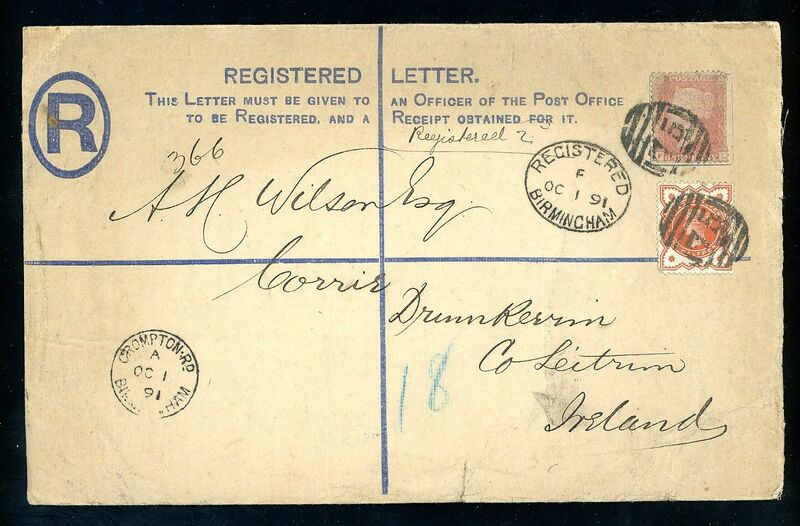 This attractive franking is on a printed envelope from the stamp dealer H. G. Hanson in Cardiff. Funnily enough I recognised this cover as I described it for a David Feldman SA auction and it sold a couple of years ago for €180. I don’t know if the buyer then was the same as the seller now, but it only sold for £93.78 this time. Well I hope you have been enjoying the summer as much as I have. Holidays and stamp exhibitions (and some work in between) have taken up a lot of my time and energy, so excuse this post for being over a month late. I start with a 6d purple on rose with a cancel I have featured before on my blog; the Baltasound mail bag seal. As it was meant to stamp wax, the strike in ink on the stamp creates negative impression. 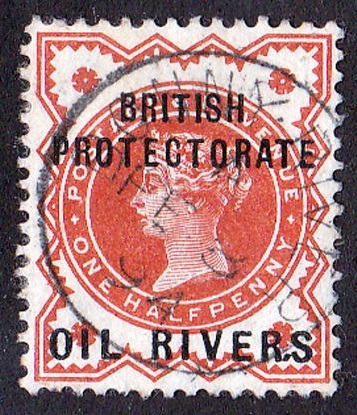 As far as I know, no covers exist, so it is likely that stamps like this were created by favour. I’ve only ever seen it on the Jubilee issue, and even so, not on the values issued after 1887 such as the 4 1/2d, 10d, 1/d blue-green and 1s green & carmine. This example sold for £42.00. 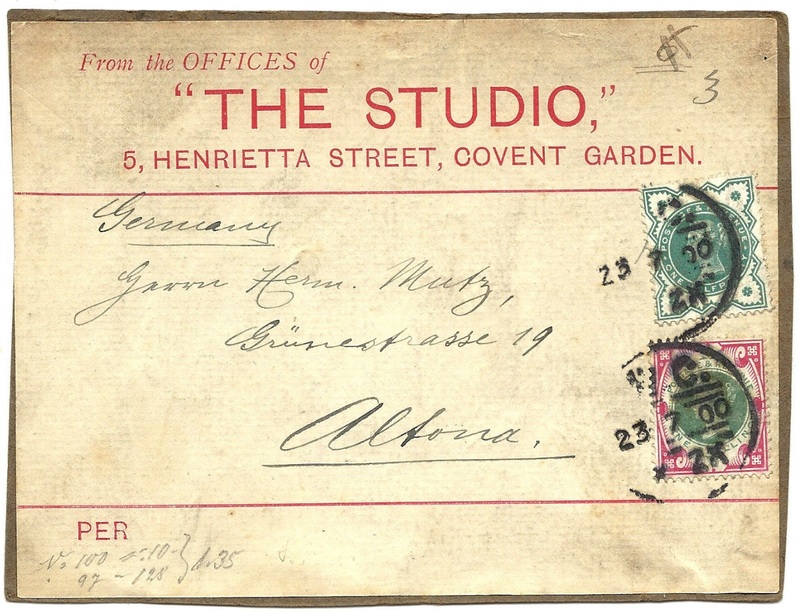 This usage of the 1s green and carmine and 1/2d blue-green on a parcel address label sold for £72.18, despite the fact that it’s a bit grubby and not particularly nicely cancelled. A strong price in my opinion even in view of the scarcity of 1s usages. 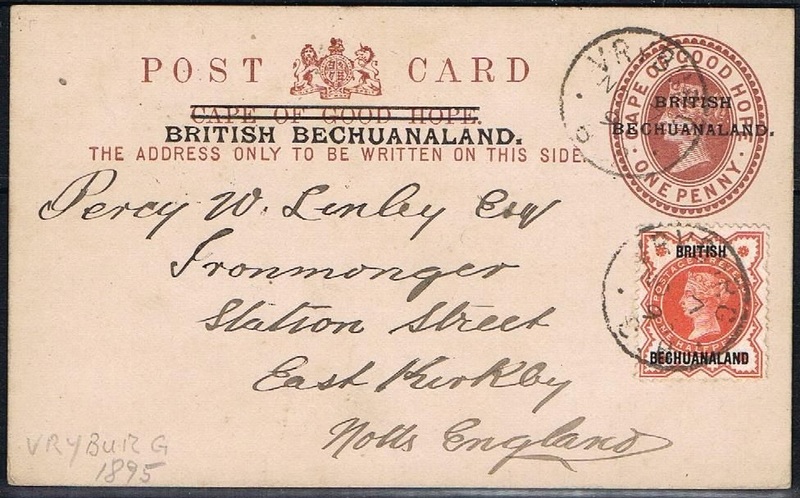 Vying for bargain of the month is this British Bechuanaland postal stationery card sent from Vryburg and uprated with a 1/2d vermilion. By no means scarce, it’s certainly more valuable than the £18.65 it sold for. This was another good buy. 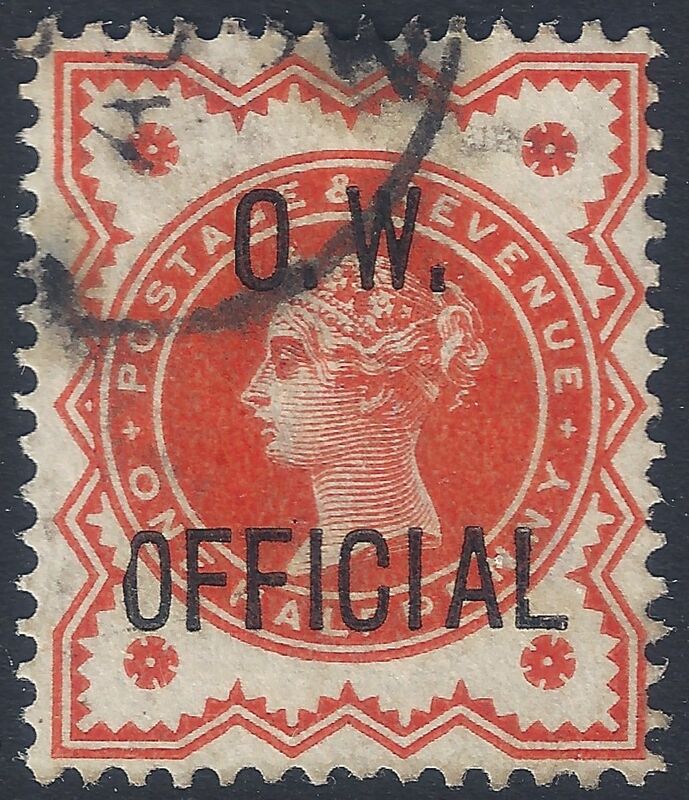 This Office of Works overprint on the 1/2d vermilion is showing the variety “chamfered O” on the O in OFFICIAL. Catalogued by Stanley Gibbons at £220 , it sold for only £10.51. And finally we have one the only item I have bought off eBay in the last couple of months. Destination mail definitely seems to be a favourite of mine (as my tag cloud on the right hand side will prove). 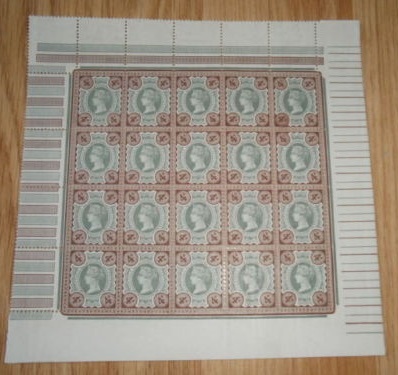 Sent to Grenada, I bought this stamped to order postal stationery envelope uprated with Jubilees for £18.65. Bargain! Spink will be offering part 5 of the “Lionheart” collection on June 17th, which contains the “proving piece” of the inverted overprint of the 1s green and carmine. Although several had been discovered and the variety was listed in the Stanley Gibbons catalogue, opinions changed and in 1916 it was de-listed and all examples regarded as forgeries. 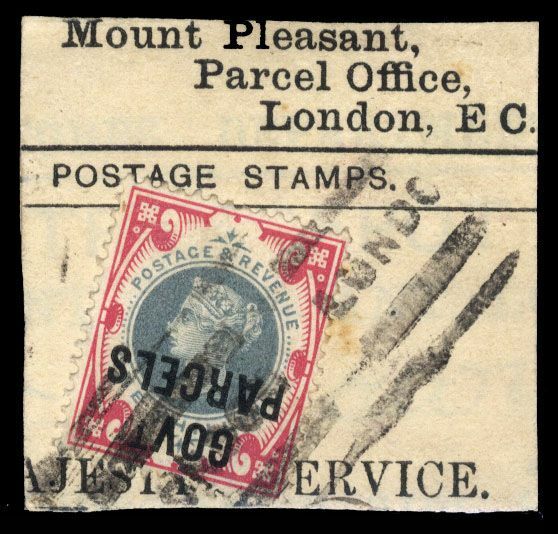 That was until the discovery of this example in 1950, clearly tied to a Post Office parcel label, that the Royal Philatelic Society of London granted it a certificate and it was restored to the Stanley Gibbons catalogue. The full story can be read in this extract from the L. N. Williams Encyclopaedia of Rare and Famous Stamps. This example was last sold at Cherrystone in 2008 for $20’700. It is being offered in June with an estimate of £10’000-£12’000. I hope that everyone who had the opportunity had a pleasant Easter holidays. We start this month off with a couple of items where I was unsuccessful bidder. 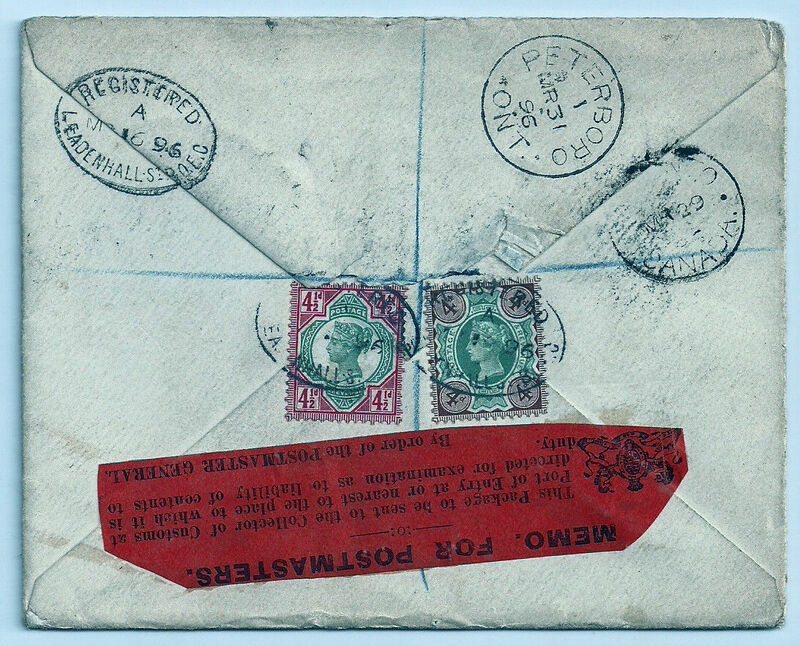 First up is an 1890 Uniform Penny Postage Jubilee envelope sent to Canada, unusually uprated with a 4d and a 4 1/2d Jubilee paying three times the UPU rate plus registration fee. Apart from being an attractive franking, it has the added interested of a Canadian customs instructional label. It sold for £85.20. Next we have a rare usage of a “Manchester Philatelic Society War Fund” charity label which I believe was to raise funds for the Boer war. It’s actually the first example I have seen on cover and it’s extra nice that it has the 1/2d vermilion and the 1/2d blue-green. It has some little faults, but I should have bid it up past the £69.50 it realised. I wouldn’t be surprised to see it in a dealer’s stock at £150+. This interesting variety sold for only 40.62. It shows an offset, caused by freshly printed sheets being stacked on top of each other and the wet ink being pressed into the reverse of the sheet above. 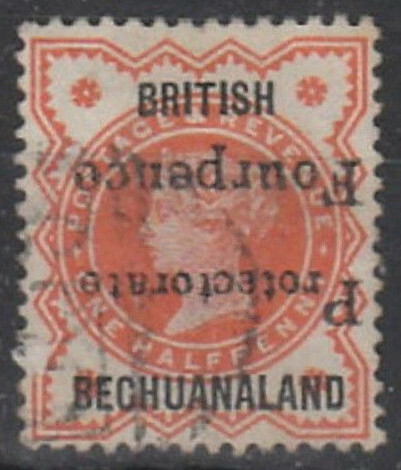 This is not a common variety on the 3d but would have sold for much more if a complete impression of the stamp could be seen. 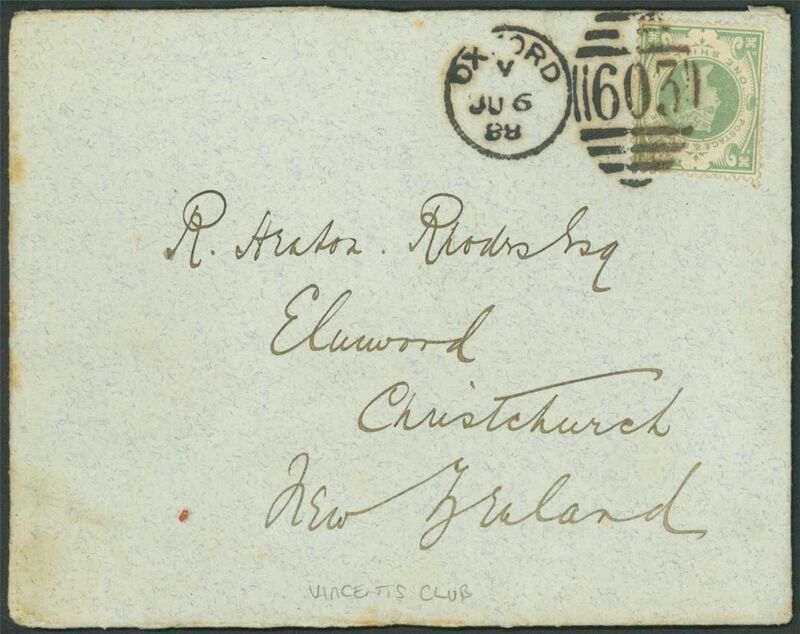 And we finish off with an item that I featured in my June 2012 eBay report; a 1s double rate single franking to New Zealand. Back then it sold for £50.29. This time it sold for £46.94. 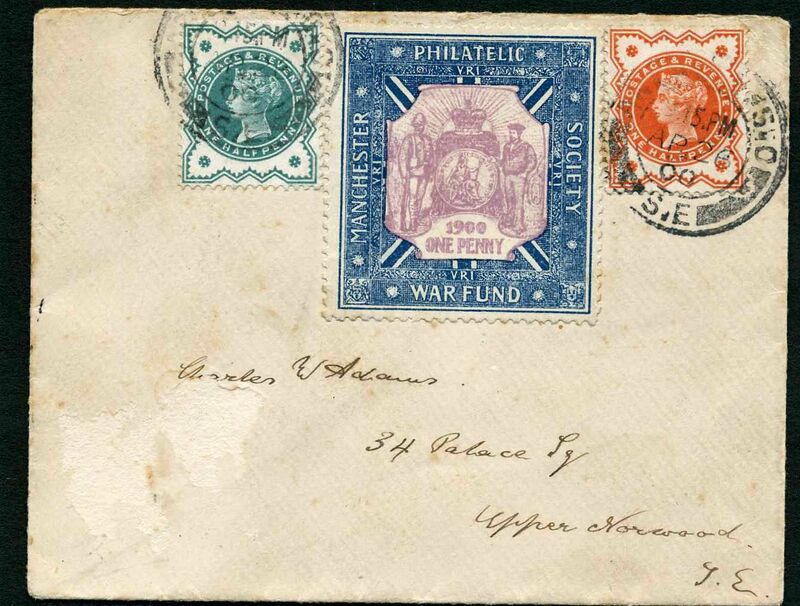 We start the month off with this attractive advertising cover from the stamp dealer William Brown of Salisbury. 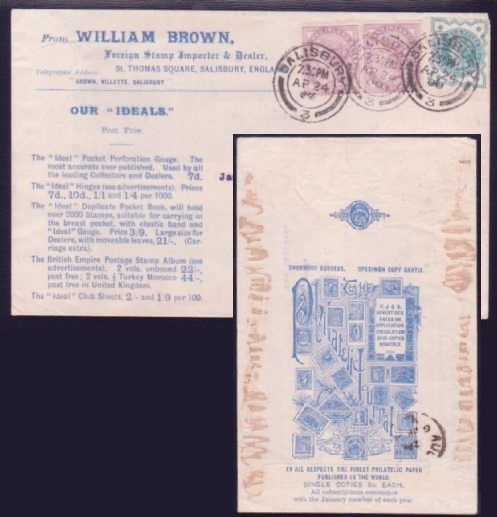 In my ever-expanding “Related Info” section, I have started an encyclopaedia-type listing of famous 20th century stamp dealers and personalities (by started, I mean I have done two…), so you can find out more about William Brown here. Even though it is “tainted” with two 1d lilacs, it is still a very attractive cover and deserving of the £160.55 paid for it. I picked up an even more attractive example (although of different design) from a dealer at Stampex for £140 which goes to show that dealers aren’t always overpriced! 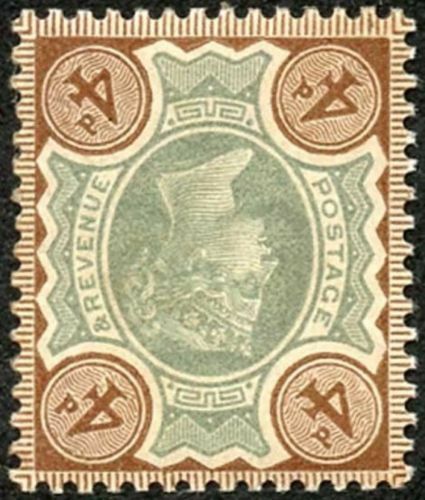 This attractively used Niger Coast 1/2d sold for £44.51 due to the dot between “R” and “S” of “RIVERS”. I’ve not seen this variety before, so I’ll be on the look out in the future to see if this proves to be a constant variety. 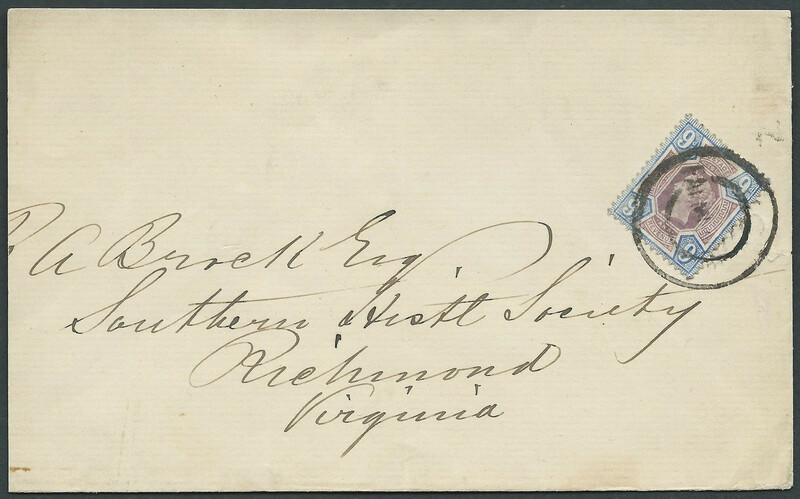 This cover has a very scarce single usage of the 9d sent to the USA. Unfortunately it was reduced at the left and top, but that didn’t stop it selling for £51.95. Probably paying 3 times the UPU rate with a late fee of 1 1/2d because I don’t think it’s philatelic. Blocks of the 1s green aren’t rare, but this example with a fresh colour is surely worth more than £43.10!! 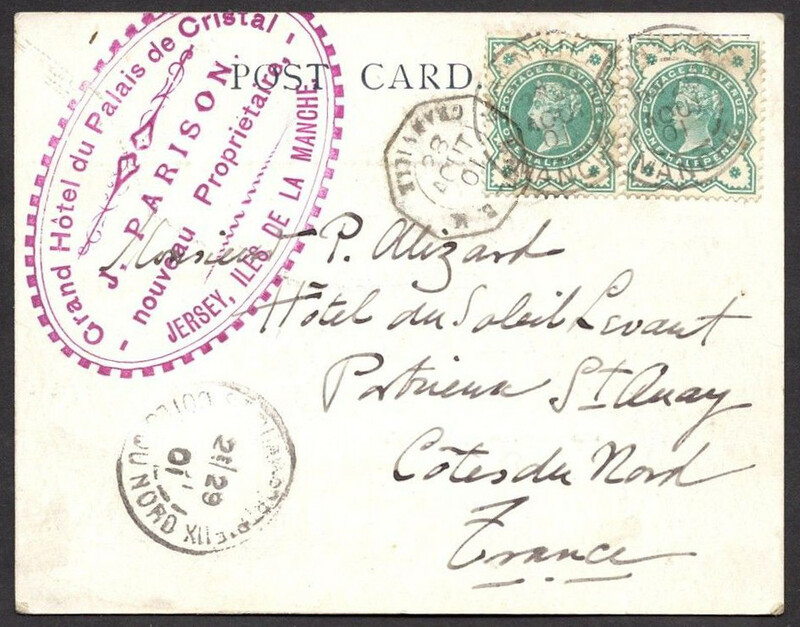 Finally we have a postcard sent from Jersey, with a 1/2d blue-green pair cancelled in transit by a French Granville cds, with a French “Boite Mobile” (or Mobile Box) hexagonal datestamp adjacent. 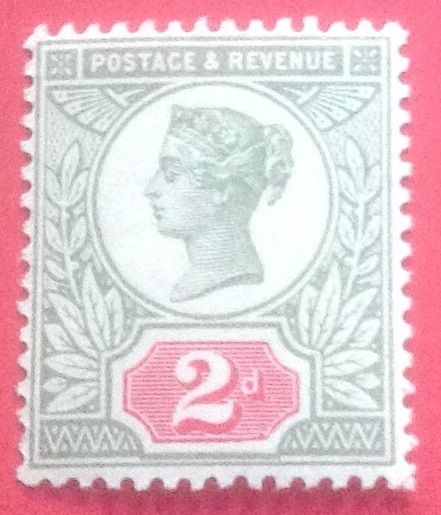 Unfortunately the stamps are a little discoloured, but it still sold for £21.17.